CNS Canada — The symbiotic relationship that crude oil and canola used to enjoy seems to have hit a snag. Chart structures have proven that crude prices have pushed and pulled canola up and down in recent years. However, since the start of 2018, the gains enjoyed by crude oil have failed to lift canola. On Jan. 10, the cost of a barrel of oil on the New York Mercantile Exchange was US$61.82. Now, that same barrel is closer to US$71. Canola, on the other hand, has fallen from the $505 per tonne mark down to the $485 per tonne mark, as of Friday’s close. According to Mike Jubinville of ProFarmer Canada, the link that existed between the two has been disrupted by the global trade disruptions emanating from the White House, and to a lesser extent China. The relationship between the two commodities should eventually return, he said. “We’ll swing back to traditional relationships between commodities but there are periods of time of disconnect and right now is one of them,” he said. Another market-watcher agreed crude’s influence on canola seems to have waned. 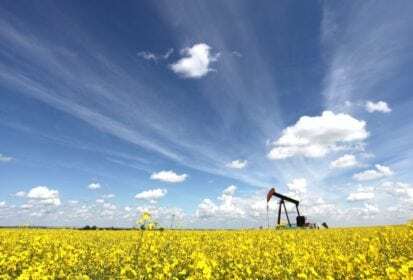 “I don’t really look at crude as a canola indicator very much anymore,” said Errol Anderson of ProMarket Communications. He added crude oil has turned into a manipulated market from global players and tends to be focused on issues stemming from the Middle East. To understand the influence crude oil initially had on canola, one first has to look at energy. Canola, like many other vegetable oils, has a stake in the biodiesel market; when crude oil is moving one way or the other, biodiesel will get caught up in its wake. That bias eventually transfers down to markets such as European rapeseed futures, Malaysian palm oil and eventually canola. Crude is also considered a leader in the market as it is the highest-traded commodity by volume and by valuation. Also, when crude oil is on the move, it always attracts the interest of the speculative community. “If crude is making a move higher and you have a lot of spec money that wants to enter commodities, and they spread it around, you get some residual effect on the ag sector,” Jubinville said. Commercials will also get more interested in buying up commodities such as canola if crude makes a jump higher, he said. For now, the escalating trade battle between the U.S. and China and unpredictability of U.S. President Donald Trump continues to cancel out most other influences. “The microcosms of Trump‘s tweets are the short-term influence that we are under now,” said Jubinville. — Dave Sims writes for Commodity News Service Canada, a Glacier FarmMedia company specializing in grain and commodity market reporting. Follow CNS Canada at @CNSCanada on Twitter.